Sadly, since we first met Badger and friends in 1908, the UK has become one of the most nature-depleted nations in the world. The Wildlife Trusts have created an animated trailer of The Wind in the Willows, which brings to life the 21st century threats that would face the much-loved characters from Kenneth Grahame’s children’s classic in today’s life. On watching it, we hope that you’ll be inspired to help put nature into recovery. We know it’s not too late to bring our wildlife back, but we must act now. We’ll be sharing ideas for what you can do to help put nature into recovery. Kenneth Grahame wrote The Wind in the Willows just over a hundred years ago. Since then, many of the UK’s wild places and the plants and animals that depend on them have been lost. For example: 97% of lowland meadows and the beautiful wildflowers, insects, mammals and birds that they supported have disappeared; 80% of our beautiful purple heathlands have vanished – with their blaeberries, sand lizards and stunning nocturnal birds, nightjars. joined up green spaces for wildlife across Teesside. I will improve my garden/local greenspace for wildlife. I will reduce my use of plastic at home and tidy up plastic waste from my local beach. the next time I am on the beach will wiggle round the waders. I will like the Tees Valley Wildlife Trust facebook page. We'd love to check back with you soon to see how you got on with your pledge and to keep you up to date with the work we're doing. 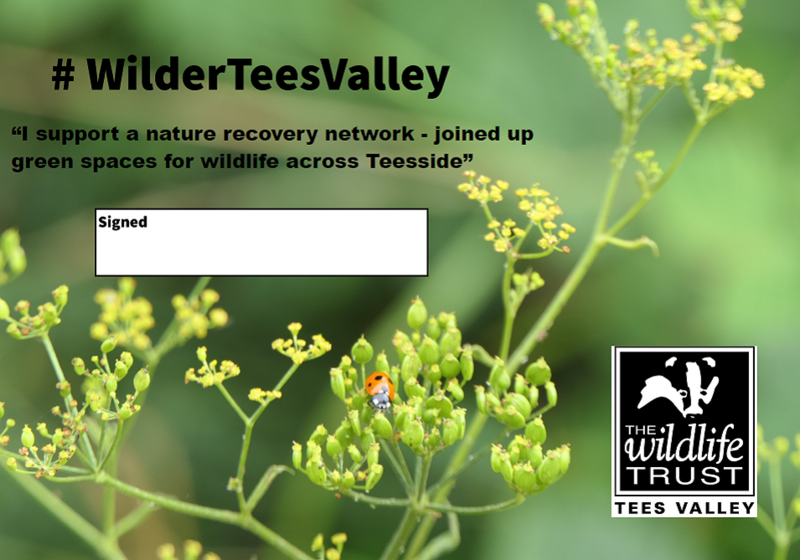 Tick this box to receive Tees Valley Wildlife Trust updates . Your details will be used by TVWT for the purposes above only and will not be sold or passed on to any other organisations. Tees Valley Wildlife Trust treats your data safely and securely.